As per Hindu religion, Tulsi Plant (Holy Basil) is a Sacred plant. It is believed that any Hindu household is not complete without the holy plant Thulasi and is planted at the entrance of the house to bring good fortune and positive energy in the house. Tulsi Vivah 2019 Date – Saturday, 9th November. 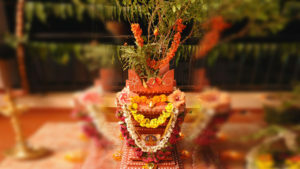 Tulsi Vivah 2020 Date – Thursday, 26th November. Tulsi Vivah is the ceremonial marriage of the Thulsi Plant to the God Vishnu or his avatar Krishna. This ceremony can be performed anytime between Prabhodhini Ekadashi and Kartik Purnima but usually, it is performed on the eleventh or the twelfth lunar day of Kartik Month. It also Signifies the end of monsoon and the beginning of the holy wedding season of Hindus. Tulsi in her former birth was Vrinda, the faithful wife of demon king Jalandhar. Once Brahma grants Jalandhar, that he would free from death as long as his wife remained virtuous and chaste. Vrinda was renowned for her faithfulness and chastity. Jalandhar began to conquer all and became egocentric, thinking he was unbeatable. So much so he waged war on Indra and Swarga (home of all the dev-gods). The Gods fled to the protection of Shiva and Vishnu, but this was to no avail. Jalandhar had become invincible in the three worlds because of the devotion of his wife Vrinda. Vishnu and Shiva soon realized that the only way to defeat Jalandhar was to break the loyalty of Vrinda. They deceived Vrinda by telling her that her husband had been killed in battle. They produced Jalandhar’s severed head and body. She thought her husband was dead and went into grief. In answer to her prayers bringing the severed body back to life, Vishnu appeared before Vrinda as Jalandhar. Vrinda was deceived into thinking that it was her resuscitated husband, so she embraced him. Realizing her mistake; she lost her virtue by touching another man: after which Jalandhar died in battle. Upon discovering the identity and the horrible trick he had committed Vrinda cursed Vishnu, stating that he would become a black stone, Shaligram – the ammonite stone found mainly in the river Gandaki. In turn, she too was cursed into becoming the Tulsi plant, her hair became the plant Tulsi used in the pooja to Gods; as a symbol of devotion. Vishnu won over by Vrinda’s unimpeachable chastity vowed to marry her every year, from therein. This has been immortalized by devotees performing their marriage annually on the holy day of Ksheerabdi Dwadashi or Karthik Dwadashi. In the Hindu dharma, all Vaishanavas celebrate this day by re-enacting this marriage of Lord Vishnu and Tulsibai. It is celebrated with great pomp and splendor as this is the marriage of our Lord. Giving a daughter in marriage is considered to be an extremely meritorious act in the Hindu dharma, it is said one who performs this marriage does so consider Tulsi to be one’s own daughter, thereby gaining the credit of Kanyadan.